Throughout the commercial market, there are a number of industries that have developed special locking products to satisfy specific common application requirements. Because of their universal use, Aztech is offering these special products as an extension to the standard product line. Aztech Locknut provides a great number of specials to customers requiring Custom Alternatives to otherwise standard parts. The easiest and most common custom alternative, many times using customer specified mating parts, special torque can be specified for any locking part. The typical requests are for a high torque range, a narrower torque limit or for a low torque. The variety available in special body type is limitless. 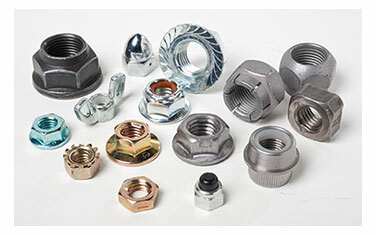 Typical requests range from heavy wall low profile flange nuts to light hex tall nuts. Aztech is a custom thread fit specialist. Our attention to the subtleties of thread fit are crucial to controlling the torque values throughout our product range. We can supply extra fine threads, locking threads, 3B thread fits and oversize threads when required. Parts that require an AQL or inspection frequency above those of industry standard are managed as specials in Aztech's standard inspection process. Any nut characteristic can be measured and reported on the standard material certification. Assemblies sometimes require more than one locking element to satisfy the safety critical requirement of the application. Aztech applies the multiple locking feature and assure each is performing within the required standard as well as the combined specification. Aztech installs several wax dry lubricant types to comply with standard and special finish requirements. Aztech's proximity to the diverse Chicagoland metal finishers assures a great variety of finishes are available with short lead times and competitive prices. Ranging from a few parts in bags & 100 packs to Gaylord boxes, Aztech can satisfy all packaging requests. Customers can specify their container and pallet labeling that may include bar code labels and product pictures. Without jeopardizing quality, Aztech can supply product compliant to Made in USA, NAFTA or Most Favored Nation at competitive prices. Aztech takes our input to heart. They do the testing, provide options and advice. Gives us a lot of confidence that we are making the right decisions.